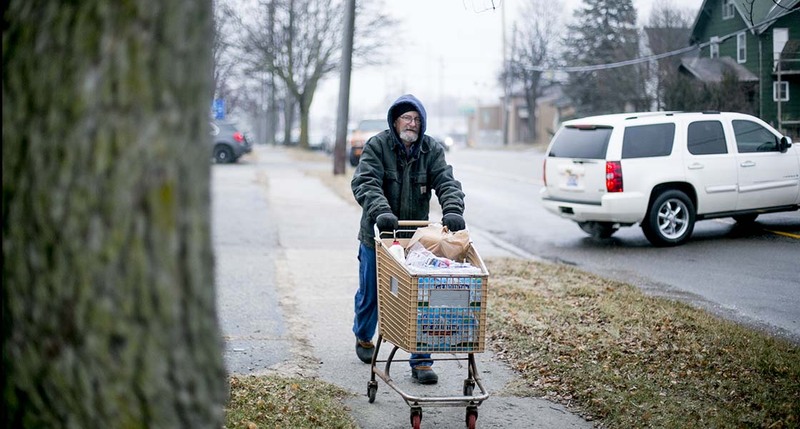 FLINT — On a freezing Tuesday morning, Jim Carnes rolled his shopping cart across the parking lot of Asbury United Methodist Church. 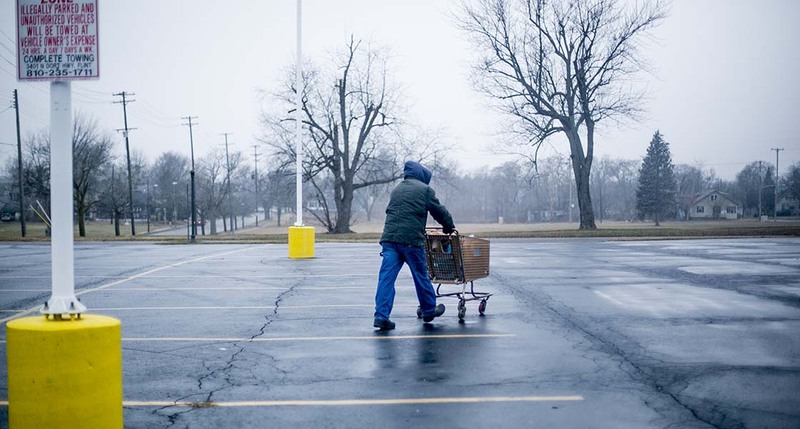 Wearing winter gear and the confidence of a man who has been here before, the retired truck driver approached a table piled high with grocery bags full of green beans, apples, chicken and other healthy food. Into his cart went the food, then a half gallon of milk. Seconds later, the last in an assembly line of volunteers added the pièce de résistance: Four cases of Nestlé’s Ice Mountain brand bottled water. Water is the primary reason why Carnes pushes his cart from his home to the church every Tuesday. 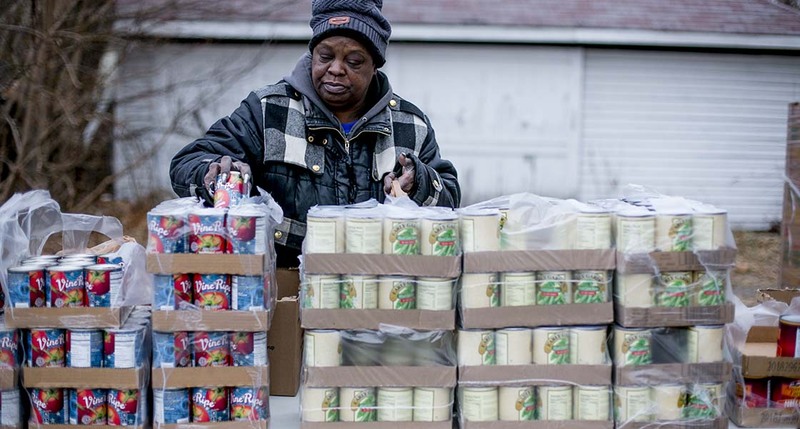 That’s when Asbury Church distributes food and water to about 500 families each week affected by a water crisis that began in 2014 and won’t seem to end. 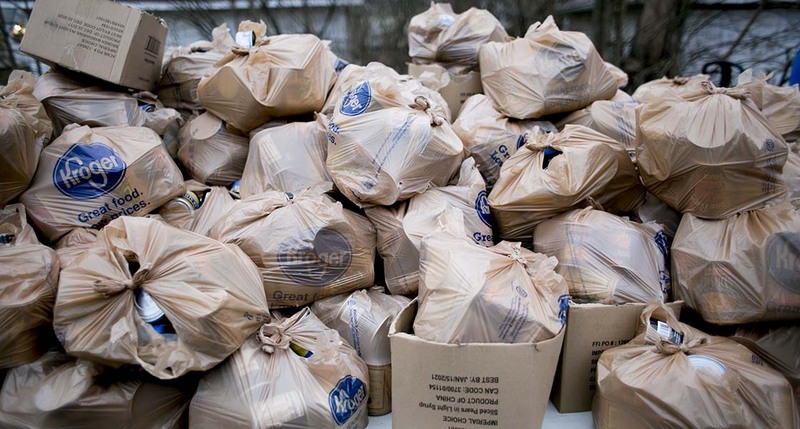 Related: Flint residents welcome Nestlé donations. But its ads? Not so much. 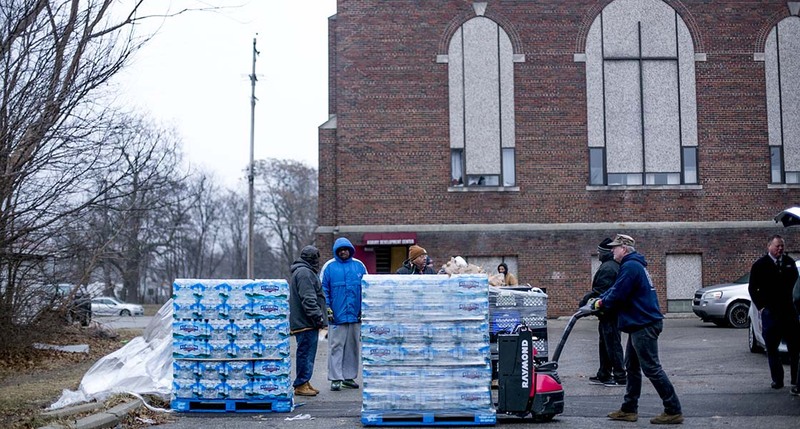 Michigan regulators declared the city’s drinking water safe one year ago, but you’d never know it from the line of cars that begin queuing at Asbury Church at 5 a.m., five hours before the help center – one of three in the city – opens. Flint Township tells the world: Please don’t confuse us with Flint. Nearly five years after Flint switched water sources to save money and exposed residents to dangerous levels of lead and bacteria, many residents have no faith in what flows from their taps – and the future of relief efforts is equally murky. Residents continue to report discolored, smelly and foul-tasting municipal water, and have received mixed messages about protections against bacteria. But after tests showed city water was “restored,” Michigan last April stopped giving away free bottled water, a service The Flint Journal reported cost $22,000 a day. The distributions have continued with privately donated supplies, but the commitment from the city’s top donor, Nestlé Waters North America, only last through April. The conglomerate, which brags of its charity to Flint in an advertising campaign, dramatically increased its donations after state regulators approved Nestlé’s plans to extract up to 210 million gallons of water per year from one central Michigan well and resell it as Ice Mountain. 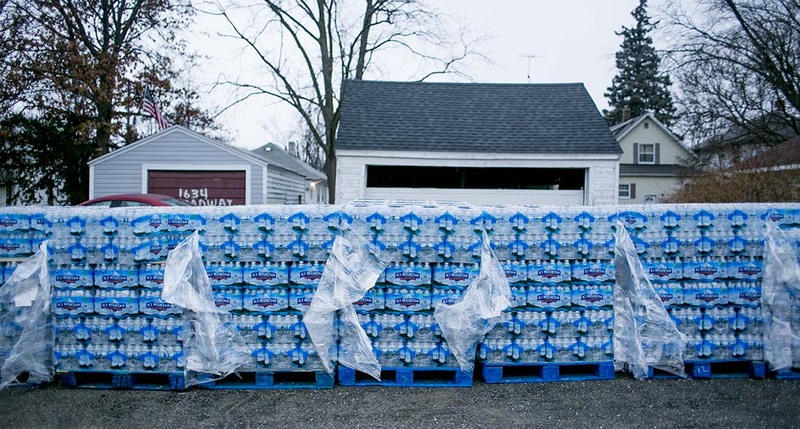 By April, Nestlé’s donations are expected to reach 6.5 million bottles during the Flint crisis, including 5 million since last May. Asked by Bridge Magazine if the company, which had sales of about $8 billion in 2017, would continue the water distribution in Flint, a company spokesman was noncommittal. "Donating water in times of need is something Nestlé Waters North America has done and will continue to do in the state of Michigan," the company wrote in an email to Bridge. “We will continue to work closely with Mayor [Karen] Weaver and the Flint community to further understand how we can help,” the company added. Likewise, new Gov. Gretchen Whitmer won’t promise to resume state funding of bottled water when donated supplies run out. She said distribution in some form should remain until Flint replaces all of its lead pipelines but has hedged on specifics. 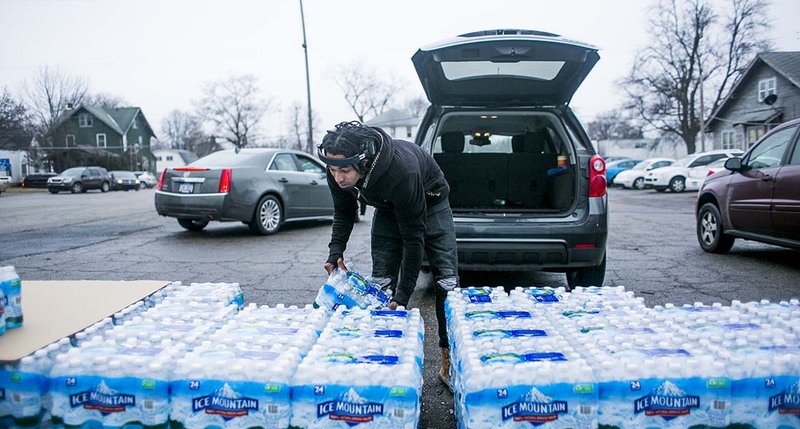 “If it’s necessary to continue providing bottled water [after Nestlé’s commitment runs out], I will make sure that happens and work with the mayor [Karen Weaver] to do that,” said Whitmer, a Democrat. In Flint, where 45 percent of residents live in poverty, demand at the city’s three help centers remains high. 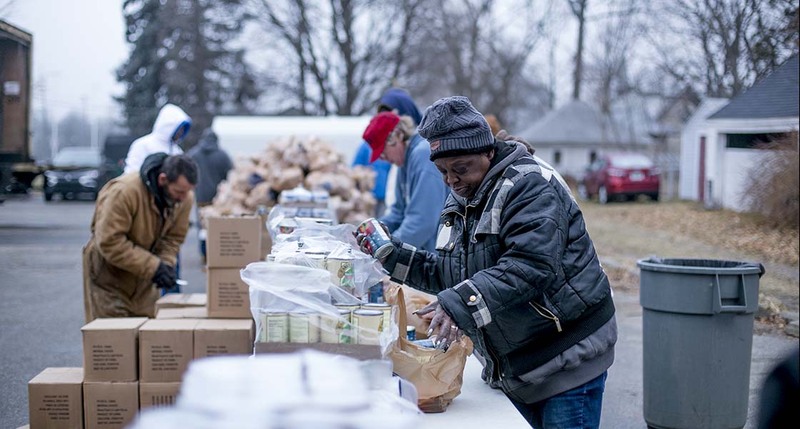 The centers are jointly operated by three churches and the Food Bank of Eastern Michigan, which uses state funds and private donations to provide food, water filter cartridges and health services. In theory, each site is open one day a week from 10 a.m. to 2 p.m, but they consistently run out of water up to 90 minutes early. So some residents go home empty-handed after long waits, while others show up to find water pallets picked clean. 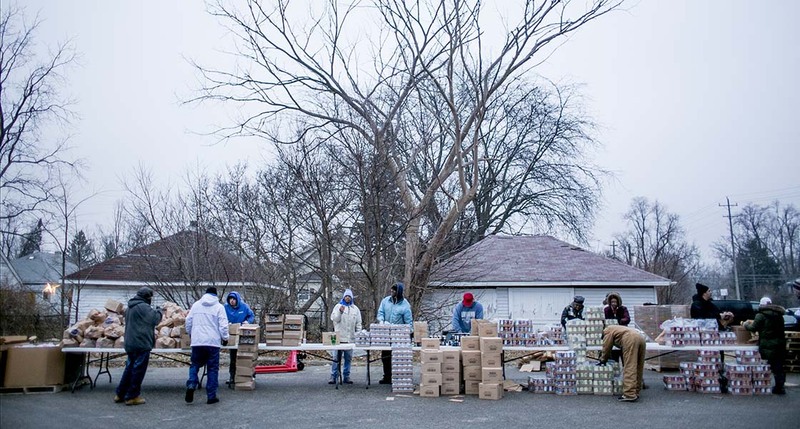 When Bridge visited Asbury Church in January, volunteers decreased distribution from four cases to three per person around noon before they ran out before 12:30 p.m.
Cars were still waiting in line. “We’re not being able to efficiently serve the homebound, the seniors, and the terminally ill, and there’s a shortcoming of water,” said Kevin Croom, operations manager for the church who oversees its help center. Bridge asked Whitmer whether she was aware of this shortfall — and whether Nestlé’s donations are enough. “I appreciate you raising that, and that’s a question I’m going to ask as soon as I’m done with this interview,” she said last week. By now, the tale of ineptitude and penny-pinching that led to the Flint disaster has become a cautionary tale. The city, led by an emergency manager appointed by then-Gov. Rick Snyder, switched drinking water sources to the Flint River in 2014 to save $5 million. The state approved the change but didn’t require any treatment to control corrosion of aging water mains, a measure that would have cost less than $40,000 per year. The highly corrosive Flint River rusted the mains, causing lead to leach into drinking water, exposing families to the neurotoxin that damages development of the brain and nervous system. The Michigan Department of Environmental Quality first ignored the problem, then tried to discredit whistleblowers. And experts suspect a spate of Legionnaires disease cases in Flint was connected to poor water treatment after the city switched sources. The tragedy led to ongoing civil lawsuits and 15 criminal charges. It forced the state to take sweeping action in Flint to restore the city’s water quality and attempt to regain residents’ confidence. That included offering free bottled water for two years under a $450 million state and federal aid package. At the height of the state program, said Croom, Flint residents had a litany of options to pick up bottled water. The state set up distribution sites called “PODS” in all nine city wards, and they were open from noon to 6 p.m. Mondays through Saturdays. In addition, help centers doled out water five days a week, providing other services including food, haircuts and social services. A state-funded homebound delivery program also allowed Croom and others to reach up to 1,200 homes per week in his part of town, reaching the frail, elderly and other residents who couldn’t travel themselves. Now Croom is lucky to reach more than a couple of dozen homes each week, which he does on a case-by-case basis, he said. “We were making sure we were delivering to them, because they needed that water.” Croom said. Distrust remains, but both Flint and state officials want residents to again get their water from faucets. The state this month announced Flint’s water tested far below the federal “action level” for lead during the second half of 2018 — just 4 parts per billion compared to 15 parts per billion standard. “To help ensure the city of Flint’s water quality is maintained, residents are encouraged to use their water to keep fresh water flowing through the distribution system,” a DEQ press release said. In independent testing required by a legal settlement, researchers at Michigan State University and University of Notre Dame found the same results as the DEQ. Public health experts have long said the federal standard does not fully protect public health. Nor would the state’s recently revised 12 parts per billion threshold. Virginia Tech University engineering professor Marc Edwards, who helped raise alarms during the Flint water crisis, is among the critics of federal lead standards. Among other things, Edwards said the level considered safe is too low and the rules have allowed regulators to artificially lower test results by gaming the system. Edwards acknowledged Flint’s water system still faces deep challenges. But improvements elevate it to the same status as cash-strapped cities across the country. “Flint has expensive, sometimes distasteful, discolored water just like thousands of communities all around the United States,” he said. That’s a reference to the city’s ambitious effort to replace every lead water line beneath the city. Flint has swapped out more than 7,900 service lines since 2016, using state funding guaranteed by a legal settlement. The city likely has thousands more pipes to go. But the replacements and filters don’t leave Flint residents satisfied either. Many, including Croom and Asbury Church volunteer Johnny Morse, said they continue to see brown water flow from their taps. Some Flint residents have questions that stretch beyond lead — such as whether the city’s drinking water system has enough chlorine to kill bacteria and yield normal tasting, clear water. Skeptics include Dr. Lawrence Reynolds, the retired president and CEO of Mott Children's Health Center in Flint and former member of Snyder’s Flint Water Advisory Task Force. He also wants more information about whether Flint officials have properly staffed and invested in upgrades to its problem-plagued water department. In December, Flint signed an agreement with the state to meet a series of goals for new hires and infrastructure investments. In November, Edwards told a multi-agency committee that city’s monitoring data shows chlorine levels considered “very, very good by any standard” for residents who periodically flush their household pipes until the water runs cold. But Edwards added a significant caveat: In many cases, adequate flushing took 10 to 30 minutes. And flushing would be recommended for any home still hooked up to lead or galvanized steel plumbing. Flushing recommendations can be tough to swallow in a city where residents pay some of the highest rates in the country — more than $900 a year for a family using 60,000 gallons a year, according to a 2016 survey by Food and Water Watch, a public interest nonprofit based in Washington, D.C.
“How can I as a physician tell a patient — or someone from the community — ‘don’t worry?’” he asked. As she settles into office, Whitmer acknowledged Flint’s trust issues will be tough to restore. Loading up his truck Asbury Church with a few cases of bottled water to deliver to homebound residents, volunteer Dupree Pringle, 57, said he doubts confidence in government will return until everyone who remembers the scandal dies and a new city is reborn. “This crisis is going to last for the rest of our lives,” he said. I still would like to know WHO ordered all the information on what chemicals are in the Flint River deleted form the BEQ web site? You know chemicals like Dixons,,,,, Agent Orange<<< lead in water DOES NOT cause rashes!! Which is it 'Agent Orange' or dioxins? Do you even know the difference, when you try to make a 50 year old chemical the problem that was created by bad actions in the past 10 years. There is a reason why people don't trust anyone, because to many are spouting a made up line and do not do their homework before making their pontifications. If someone could offer one good reason to trust anyone in that on going debacle then we might find a first step in ending this downward partisan political spiral we are on. I am sorry, but I am one who trusts no one nor anything said about the Flint problems. This is what happens when 60 years of politicians in charge who don't really care. Lead lines could have been replaced starting 30 years ago. 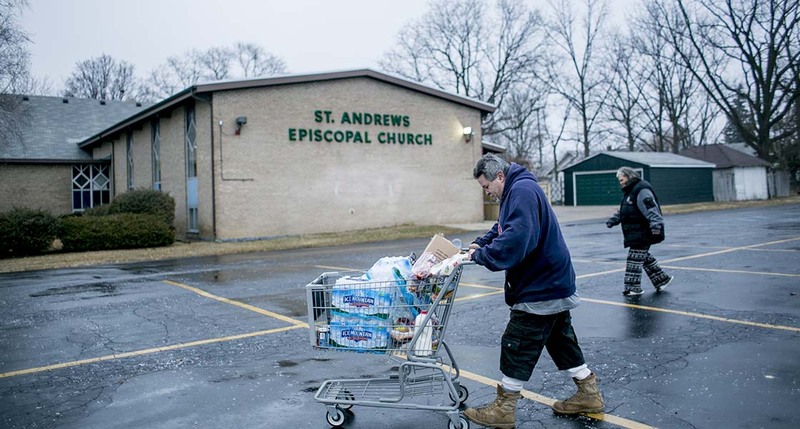 Disturbing in this story is that 45% of residents in Flint are below poverty level. Don’t we have a super low unemployment rate in the state? Aren’t minority wages the highest they have been in years? And a 60 year old man retired when story after story says boomers are working longer. A truck driver no less with an acute shortage of truck drivers. Now the man may be disabled, in which case he gets a pass. It’s more like years and years of democratic rule have convinced enough people that everything in life should be free and if you vote for us, the government will take care of everything. Which President signed NAFTA, Bones? And also signed off on allowing China to enter the WTO making it significantly easier for them to export products? Psst. I'm a socialist. I hate Clinton for selling out the American worker and wrecking the Mexican economy with the corn subsidies. Now do you want to address my point that the blame lies not with the poor of Flint, but with the companies that abandoned the city en masse in pursuit of more exploitable labor? If he didn't sign those items I've mentioned above, those companies would have very little (if any) financial incentive to leave. * More Job Openings than Job Seekers (a US Record). *Fewest New Unemployment Claims last month since 1969...a great statistic considering we have a much larger population. *As for Truck Drivers....Walmart in the last year or so has hired ~1500 new Truck Drivers with the average salary of $90K. And we should be upset because the usual characters in politics have so screwed over this city? Just send in the Army Corp Engineers and tell the political parties and shysters to get out of the way. Will The Bridge begin reporting daily regarding whether or not Gov. Whitmer has answered this question? It had no issues with doing the same during last year's lame duck shenanigans. And regarding Arjay's point above, almost $90k/yr to get back in the seat, can end his problems very quickly. Changing standards despite the science is what the Japanese Government has done after Fukushima. That, like the lead issue in Flint is a denial of human rights that nations signed to honor as part of the United Nations. I am shocked that my government would put on a show on over walls, over coup d'etats, over Russians, promote more miitarism, spend up to $1.2 trillion dollars for new nuclear weapons and we cannot find clean, safe drinking water not just for Flint but for all of the nation. No more Republicans or Democrats that are more interested in themselves than We the People.